After years of languishing in the shadow of their multi-story cousins, single-story homes are gaining in popularity once again. If you’ve been thinking of buying a new home, you probably debated whether or not you wanted a single story, or ranch style home, or a multi-story home. There’s plenty to love about having everyone on the same floor: they’re easier to heat and cool, they’re quieter since there isn’t anyone running around above you, easy to clean, and not needing to worry about navigating stairs every day. Parents love being able to keep their eye on young children and older homeowners enjoy being able to stay in their homes longer. Not only that, but single-story homes have an incredible resale value! New construction single-story homes are rare in the Bay Area, especially in the East Bay and we’re proud to offer 11 great single-level homes at Bellavista in Moraga! Chose from seven single-level floorplans with 4 bedrooms and 3.5 to 4.5 baths, ranging in size from approximately 3,131 to 3,662 square feet of luxurious living space, including easy access to luxurious features like California Rooms, courtyards, and outdoor kitchens. SummerHill homes already stands apart from any other home thanks to the care and attention we pour into every home we build. Every residence is built with high quality construction standards we’re known for, quality finishes with contemporary designs, open and bright floor plans, Thermador appliances, and California rooms for impressive indoor-outdoor living. 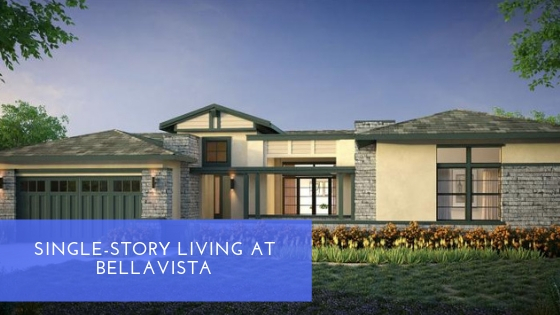 Bellavista will be opening for sales on April 13th so be sure to join our interest list to be the first to receive up-to-date information on grand opening events and sales releases. With several new home communities throughout the Bay Area, you’re bound to find the right home in the right neighborhood for your family. Visit us online to learn more about Bellavista or any of our other communities of distinctions.